For the lake in Australia, see Lake Powell, Victoria. 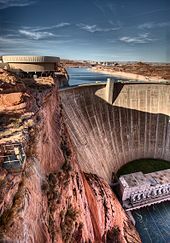 In the 1940s and early 1950s, the United States Bureau of Reclamation planned to construct a series of Colorado River dams in the rugged Colorado Plateau province of Colorado, Utah, and Arizona. Glen Canyon Dam was born of a controversial damsite the Bureau selected in Echo Park, in what is now Dinosaur National Monument in Colorado. A small but politically effective group of objectors led by David Brower of the Sierra Club succeeded in defeating the Bureau's bid, citing Echo Park's natural and scenic qualities as too valuable to submerge. By agreeing to a relocated damsite near Lee's Ferry between Glen and Grand Canyons, however, Brower did not realize what he had gambled away. At the time, Brower had not actually been to Glen Canyon. When he later saw Glen Canyon on a river trip, Brower discovered that it had the kind of scenic, cultural, and wilderness qualities often associated with America's national parks. 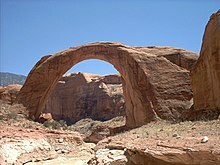 Over 80 side canyons in the colorful Navajo Sandstone contained clear streams, abundant wildlife, arches, natural bridges, and numerous Native American archeological sites. By then, however, it was too late to stop the Bureau and its commissioner Floyd Dominy from building Glen Canyon Dam. Brower believed the river should remain free, and would forever after consider the loss of Glen Canyon his life's ultimate disappointment. Glen Canyon Dam was built to solve the downstream delivery obligations of the Upper Basin states. Lake Powell is an "aquatic bank" built to fulfill the terms of the "Compact Calls" of Lower Basin. If the Compact had required the Upper Basin to deliver half the flow of the Colorado in low water years, rather than a fixed amount, the burden of drought would have been spread equally between the basins and there would have been no need to build the dam. It's ironic that the lake is named after John Wesley Powell, who planned to settle the West based on the facts of hydrology, not politics. Upon completion of Glen Canyon Dam on September 13, 1963, the Colorado River began to back up, no longer being diverted through the tunnels. The newly flooded Glen Canyon formed Lake Powell. Eleven years elapsed before the lake filled to the 3,700 feet (1,100 m) level, on June 22, 1980. The lake level fluctuates considerably depending on the seasonal snow runoff from the Rocky Mountains. 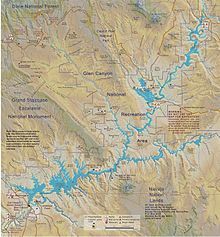 The all-time highest water level was reached on July 14, 1983, during one of the heaviest Colorado River floods in recorded history, in part influenced by a strong El Niño event. The lake rose to 3,708.34 feet (1,130.30 m) above sea level, with a water content of 25,757,086 acre feet (31.770898 km3). Colorado River flows have been below average since the year 2000, leading to lower lake levels. In the winter of 2005 (before the spring run-off) the lake reached its lowest level since filling, an elevation of 3,555.10 feet (1,083.59 m) above sea level, which was approximately 150 feet (46 m) below full pool. Since 2005, the lake level has slowly rebounded, although it has not filled completely since then. Summer 2011 saw the third largest June and the second largest July runoff since the closure of Glen Canyon Dam, and the water level peaked at nearly 3,661 feet (1,116 m), 77 percent of capacity, on July 30. However, the years 2012 and 2013 were, respectively, the third and fourth-lowest runoff years recorded on the Colorado River. By April 9, 2014, the lake level had fallen to 3,574.31 feet (1,089.45 m), largely erasing the gains made in 2011. Colorado River levels returned to normal during water years 2014 and 2015 (pushing the lake to 3,606 feet (1,099 m) by the end of water year 2015), a trend projected to continue in 2016. However, the Bureau of Reclamation in 2014 reduced the Lake Powell release from 8.23 to 7.48 million acre-feet, for the first time since the lake filled in 1980. This was done due to the "equalization" guideline which stipulates that an approximately equal amount of water must be retained in both Lake Powell and Lake Mead, in order to preserve hydro-power generation capacity at both lakes. This resulted in Lake Mead declining to the lowest level on record since the 1930s. These data are for the Wahweap climate station on Lake Powell just south of the Utah-Arizona border. Glen Canyon was carved by differential erosion from the Colorado River over an estimated 5 million years. The Colorado Plateau, through which the canyon cuts, arose some 11 million years ago. Within that plateau lie layers of rock from over 300 million years ago to the relatively recent volcanic activity. Pennsylvanian and Permian formations can be seen in Cataract Canyon and San Juan Canyon. The Moenkopi Formation, which dates from 230 million years ago (Triassic Period), and the Chinle Formation are found at Lees Ferry and the Rincon. Both formations are the result of the ancient inland sea that covered the area. Once the sea drained, windblown sand invaded the area, creating what is known as Wingate Sandstone. The more recent (Jurassic Period) formations include Kayenta Sandstone, which produces the trademark blue-black "desert varnish" that streaks down many walls of the canyons. Above this is Navajo Sandstone. Many of the arches, including Rainbow Bridge, lie at this transition point. This period also includes light yellow Entrada Sandstone, and the dark brown, almost purple Carmel Formation. 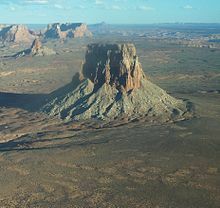 These latter two can be seen on the tops of mesas around Wahweap, and the crown of Castle Rock and Tower Butte. Above these layers lie the sandstone, conglomerate and shale of the Straight Cliffs Formation that underlies the Kaiparowits Plateau and San Rafael Swell to the north of the lake. Hite Crossing Bridge, the only bridge spanning Lake Powell. Although the bridge informally marks the upstream limit of the lake, when the lake is at its normal high water elevation, backwater can stretch up to 30 miles (48 km) upstream into Cataract Canyon. The lake's main body stretches up Glen Canyon, but has also filled many (over 90) side canyons. The lake also stretches up the Escalante River and San Juan River where they merge into the main Colorado River. This provides access to many natural geographic points of interest as well as some remnants of the Anasazi culture. Antelope Island lies mostly in Arizona just north of Page in the southwest part of Lake Powell. The Castle Rock Cut is one of the most important navigational channels in the lake; it was blasted as early as the 1970s to allow boaters to bypass the winding canyons between the Glen Canyon Dam and reaches of Lake Powell further upstream – saving, on average, one hour of travel time. The cut has been deepened several times since then, to allow the use of the channel during droughts. During the protracted 21st century drought, however, the lake has dropped so quickly on several occasions that the cut dried up during the summer tourist season, most recently in 2013. Continued deepening of the Castle Rock cut has been criticized for its high cost, but boaters and the National Park Service argue that it improves safety, saves millions of dollars in fuel, and improves emergency response time. Currently most Marinas on the lake don't have Automatic Identification System monitoring stations that transmit boat positions to the AIS websites for the boating community. A substantial number of vessels on the lake do not have AIS transponders as there currently are no mandatory requirements for AIS usage for this body of water. Extra precautions must be taken with respect to boating safety, as the fractal nature of the lake's hydrologic surface area can allow vessels with limited charting equipment to become easily lost. The burying of human (and pet) waste in Glen Canyon National Recreation Area is prohibited. Anyone who camps farther than a quarter of a mile from a marina, however, must bring a portable toilet. Pet waste must also be packed out. Some of these fish species are on the US Endangered Species List. Currently most native species on the Colorado River Basin are subject to ongoing restoration efforts of some kind. Zebra and quagga mussels first appeared in the United States in the 1980s. The mussels were initially brought to the United States through the ballast water of ships entering the Great Lakes. These aquatic invaders soon spread to many bodies of water in the Eastern United States and have even made their way to the western United States. In January 2008, Zebra mussels have been detected in several reservoirs along the Colorado River system such as Lakes Mead, Mojave, and Havasu. By the early 2000s Arizona, California, Nebraska, Kansas, Colorado, Nevada and Utah have all confirmed the presence of larval zebra mussels in lakes and reservoirs. Zebra and quagga mussels can be destructive to an ecosystem due to competition for resources with native species. The filtration of zooplankton by the mussels can negatively impact the feeding for some species of fish. Zebra and quagga mussels can attach to hard surfaces and build layers on underwater structures. The mussels are known to clog pipes including those in hydroelectric power systems, thus becoming a costly and time-consuming problem for water managers in the West. Control policies have recently been introduced to alleviate the hydroelectric problems as well as ecological problems faced by Western infestation. Beginning in 1999 Lake Powell began to visually monitor for the mussels. In 2001 hot water boat decontamination sites were established at Wahweap, Bullfrog, and Halls Crossing marinas. 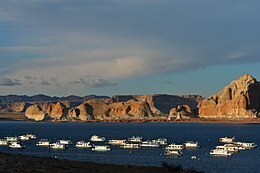 In January 2007, zebra mussels were detected in Lake Mead and new action plans were announced to prevent the spread of mussels to Lake Powell. In August 2007, preliminary testing was positive for zebra or quagga larvae in Lake Powell. These tests were deemed false positives, but adult quagga mussels were found in 2013. In August 2010, Lake Powell was declared mussel free. 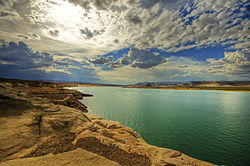 Lake Powell introduced a mandatory boat inspection for each watercraft entering the reservoir beginning in June 2009. Effective June 29, 2009, every vessel entering Lake Powell must have a mussel certificate, although boat owners were allowed to self-certify. These measures were intended to help prevent vessels from transporting Zebra mussels into Lake Powell. Despite these measures, quagga mussel DNA was detected in 2012 and live mussels were found at a number of sites including the Wahweap Marina in Spring and Summer 2013. As of June 2013[update], the NPS was attempting a diver-based eradication program to find and remove mussels before the lake became infested. 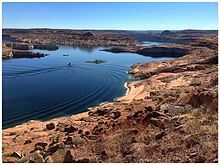 ^ a b c d "Lake Powell Water Database". lakepowell.water-data.com. 2013. Archived from the original on 17 March 2013. Retrieved 15 March 2013. ^ Martin, Russell (1989). A Story that Stands Like a Dam: Glen Canyon and the Struggle for the Soul of the West. New York: Henry Holt & Company. ISBN 0-8050-0822-5. ^ McPhee, John (1971). Encounters with the Archdruid. New York: Farrar, Straus, and Giroux. ISBN 0-374-14822-8. ^ Grace, S. "Dam Nation" 2012, PP 114. ^ "Upper Colorado Region Water Resources Group : Lake Powell : Water Operations Data: Elevation, Content, Inflow & Release for last 40 Days". United States Bureau of Reclamation. 2013. Archived from the original on 17 March 2013. Retrieved 15 March 2013. ^ "Upper Colorado Region Water Operations: Current Status: Lake Powell". United States Bureau of Reclamation. 2013. Archived from the original on 10 March 2013. Retrieved 15 March 2013. ^ "Lake Levels/River Flow". Arizona Game and Fish Department. 2013. Archived from the original on 16 July 2010. Retrieved 15 March 2013. ^ "Water Database". Lakepowell.water-data.com. Archived from the original on 2016-09-24. Retrieved 2016-07-22. ^ Correspondent, Todd Glasenapp Sun. "Deeper Lake Powell shortcut completed". azdailysun.com. Archived from the original on 2015-07-30. ^ "Castle Rock Cut To Be Deepened Again at Glen Canyon National Recreation Area - National Parks Traveler". www.nationalparkstraveler.com. Archived from the original on 2016-08-29. ^ "Zebra Mussel Watch". Friends of Lake Powell. 2009. Archived from the original on 8 May 2013. Retrieved 15 March 2013. ^ "Zebra Mussels detected in Lake Pueblo State Park". Colorado Parks and Wildlife. 17 January 2008. Archived from the original on 15 July 2012. Retrieved 15 March 2013. ^ "Zebra mussels detected at Lake Pueblo State Park". The Denver Post. 17 January 2008. Archived from the original on 3 May 2014. Retrieved 15 March 2013. Glick, Daniel (April 2006). "A Dry Red Season: Uncovering the Glory of Glen Canyon,". National Geographic. Retrieved 2007-10-21. 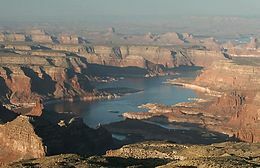 Wikimedia Commons has media related to Lake Powell. Water Level in Lake Powell, slide show of ten years of images from NASA’s Landsat 5 satellite, showing dramatic fluctuations in water levels in Lake Powell.